When you’re a middle-aged mixed martial artist, the march of time, more than any other fighter, becomes your most terrifying opponent. Suddenly waiting around for the right opportunity or the right payday or for the approval of your promoters is no longer reasonable, not when the passing of each month is like the tolling of a bell and a reminder of your ever-impending mortality. No wonder then that Anderson Silva is so upset these days. Though he was once the greatest mixed martial artist in the world—blessed with impossible artistry and speed and that rarest of all fighting gifts: the ability to win fights even before they began—Silva is now a 42-year-old man who’s only won one fight in five years, and that controversially. Gone are the cinematic speed and the air of invincibility—all that glorious impossibility—replaced by all-too-human fragility and a heightened sense of the waning of skills and the passing of time. 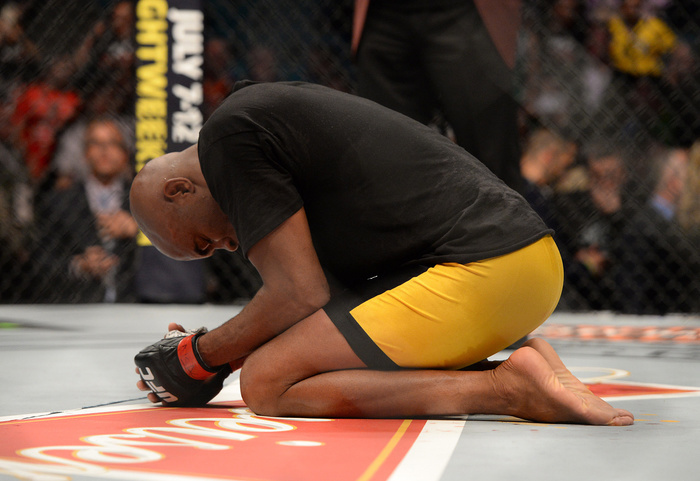 Silva recognizes this and as result wants to get back into the cage as quickly as possible. While the old magic may be gone the will remains, but not even will can stand up to inevitable decay. So Silva is crying out to fight, and getting back nothing in return. Earlier this week, on MMAFighting.com’s The MMA Hour, Silva, generally one of the more soft-spoken stars the sport has produced, was uncharacteristically harsh and blunt in his disappointment with the UFC for not setting him up with the fights he wants, he feels he’s earned, and that he claims they promised him. Take the case of Georges St-Pierre, Silva’s stiffest competition for the title of Greatest Fighter Ever (with Jon Jones and Demetrious Johnson right there in the running): Silva and GSP circled each other for years back when the former was the middleweight champion of the world and the latter the welterweight champion. Back in 2008 and 9 and 10, rumors of a possible superfight between the two men were constant catnip to MMA fans. Then Silva lost his belt to Chris Weidman on July 6. 2013, and GSP went into semi-retirement four months later, and that was the end of both an era and the demand for the fight to end all fights. But according to Silva, the possibility of that fight was very much alive even after GSP disappeared. In fact it was part of the motivation behind Silva signing his most recent UFC contract, in 2014. “When I signed my last contract, Dana White and Lorenzo [Fertitta] say, ‘Okay, when Georges St-Pierre is back, you go and fight superfight, you and Georges St-Pierre,’” Silva said. Now, though, GSP has returned, but it not’s Silva he’ll be fighting. Instead he’ll facing middleweight champion Michael Bisping, this despite the fact that St-Pierre hasn’t fought for three years and has never fought at middleweight, and that Silva believes he is the rightful heir to a title shot after “beating” (in his mind, not those of the judges) Bisping last year, a fight that resulted in Bisping getting his title shot against Luke Rockhold four months later. For Silva, nothing about the GSP-Bisping fight makes sense. To make matters worse, the UFC hasn’t come through on a promise Silva says they made to get him a new opponent for the UFC 212 card on June 3 in his hometown of Rio de Janeiro. Silva’s original opponent, Kelvin Gastelum, was pulled after testing positive for marijuana, and as it stands a picture of the former Greatest Ever is currently on the fight card next to a silhouette, a sad metaphor for a fading career. “To Be Determined,” the card says, but Silva is unconvinced the UFC will come through with anyone, much less the opponent he wants, No. 1 contender Yoel Romero, and under the circumstances he thinks are reasonable: fighting for an interim middleweight title belt. Silva even went so far as to claim he’ll retire if that title fight doesn’t happen in June—pointing out that the specter of time is against him. To show his desire for that fight, Silva has even said he would fight Romero for nothing, as long as he has one more chance to fight for his hometown fans. Unfortunately, by “nothing” Silva means an interim title shot, an unreasonable and unnecessary demand that may be the sticking point keeping him from the fight he wants before time finally swallows him and his beautiful career for good.